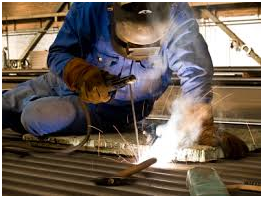 Manual Metal Arch Welding (MMAW) process also known as Shielded Metal Arc Welding (SMAW) processes are most primitive, simple to set up and use. Most of the welders have grown up using the MMAW process in villages and small towns of India. The low cost of equipment makes the process accessible to most people, and MMAW has no special requirements such as external gas shielding or high-frequency arc initiation. Sound welds are easily produced and the process doesn’t tend to result in weld defects such as lack of fusion which is common in GMAW. MMAW is a welding process that creates an electric arc between a hand held, flux-coated, consumable filler wire and the work piece. The arc heat melts the parent metal and filler wire. The flux coating breaks down in the arc to produce a gaseous shield that excludes atmospheric gases from the weld zone. 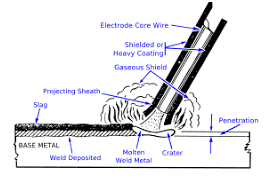 The flux coating also provides a de-oxidizing action and forms a slag on the cooling weld. 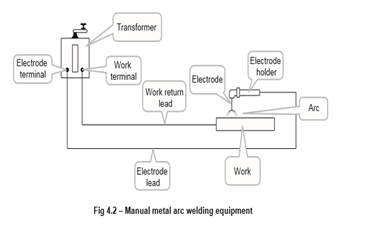 The MMAW welding process needs a suitable and constant current power source (AC or DC), a hand piece, a work clamp, leads and flux-covered consumable electrodes. The advantages of the MMAW are its versatility and the availability of a wide range of consumables. 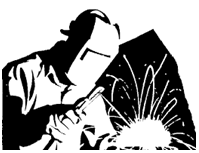 Set-up time is short, making the process ideal for small jobs, short production runs, and where the welding is carried out on site. Although faster than some welding processes, MMAW has lower deposition rates than many of the newer welding processes that use a higher current. The process has a low operator duty cycle, with the operator spending a lot of time changing electrodes and chipping slag. These two factors combine to limit the application of this process, especially if high production rates are required.